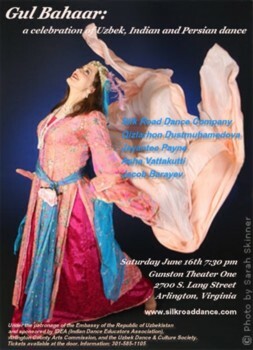 Arlington, VA – The sumptuous beauty of the Moghul court came alive at the Gunston on Saturday, June 16. The performance, 'Gul Bahaar : A celebration of Uzbek, Indian and Persian dance” honored three distinct Eastern cultural traditions which interacted and influenced each other. Classical pieces and folkloric dances were presented in lavish, colorful costumes by DC’s premiere Middle Eastern and Central Asian dance ensemble, the award- winning Silk Road Dance Company. People’s Artist of Uzbekistan Qizlarhon Dustmuhamedova and Indian guest artists Asha Vattakutti and Jayantee Payne presented North Indian selections. for Indians, he is remembered as a cruel conqueror. But from either perspective, Babur is recognized as the founder of the Moghul dynasty that blended Central Asian Islamic culture with North Indian Hindu traditions. the Taj Mahal. One vibrant result of this cross-cultural contact remains today in the classical dance genre known as Kathak which developed into its contemporary form at the Moghul courts.